Did you know that the human brain and heart are made up of more than 73% water? There are so many reasons why water is important to the body. Its no wonder drinking water is so vital to every part of who we are. Water is one thing we absolutely cannot live without! As a parent, you know first-hand how hard it is to get your child to drink enough water during the day. This is especially true if you've heard the "Mom I need a glass of water! I am soooooo thirsty" at bedtime. With two very active young boys, this is my reality. Hydration is a must! When Dexter was younger he was so active and I would often forget to make him drink water throughout the day. His lips became dry and he would end up very thirsty at night before bed (once he slowed down for the day and was thinking about it!) So I created the "water challenge" where I would fill up a glass of water for each of us. I would yell "Water Challenge!!!" and he would run over to me and "race" me to see who could finish their water first. It was always a fun little game between the two of us not only because we were doing something good for our bodies but also because it was something we could do together! I sure wish that Gululu Go would have been around then as I am sure he would have loved Gululu Go so much more than water challenge!! You're probably thinking, 'what is Gululu Go'? If you ask me, it is a revolutionary interactive kids water bottle that not only makes drinking water fun for kids but also allows us, as parents, to track their water consumption! Its a game-changer in the fight to hydrate! Pretty cool eh? Watch this awesome video to learn more. informed of their children’s hydration progress through a connected smartphone app. So since they just launched Gululu Go TODAY (May 24th, 2018) they are celebrating by offering 35% off your purchase. This is limited to the first 100 purchases so hurry now and grab an adventure for you and your kids! Their bodies will thank you and they will love it! 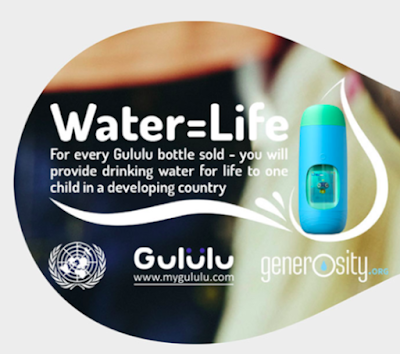 Just when you didn't think Gululu Go could be any more rad, let me tell you that by purchasing just ONE Gululu Go bottle, you are providing free drinking water FOR LIFE for a child in a developing country! *Please note Gululu Go Comply with COPPA - "children's online privacy protection act." Do you have any tips or tricks to help your kids stay hydrated? Do you struggle with getting your children to drink more water? I want to hear from you!! !